As a reader in this year’s Rotary Read-In event, we are pleased to invite you to be our guest at one of our local Rotary meetings. Please RSVP to attend a Rotary meeting by reaching out to one of the contact persons listed below. Help light up a classroom by reading to them for one hour! Come have fun reading to Kindergarten-3rd graders! It only takes one hour for one day to brighten the lives of a whole classroom! Sign-ups now underway! Over 800 individuals participated last year. 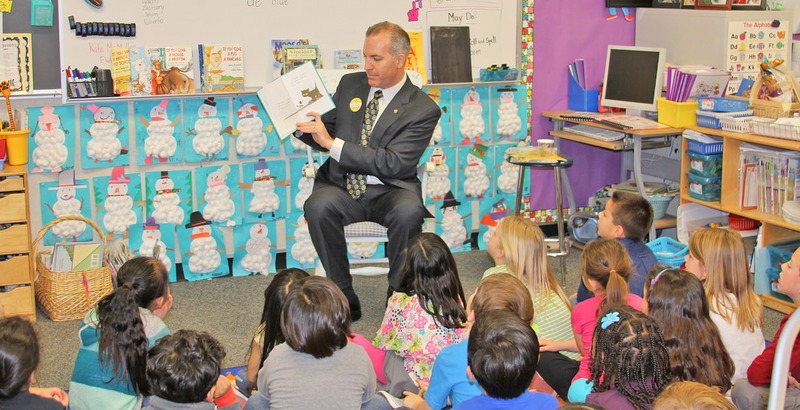 It's the Annual Rotary Read-In and you can help light up a classroom of Kindergarten to 3rd graders by reading to them for one hour on Thursday, February 21st from 10am to 11am at pre-assigned schools. The five Stockton Rotary Clubs invite you to join local companies, college organizations, business groups, church groups, and many community leaders and citizens for this fun activity. If possible, please join this special opportunity to promote literacy among the children of our community by signing up for this event. It only takes about 1 hour of your time, but provides children with a great learning experience and you with a very rewarding time. You will be assigned to a Kindergarten-3rd grade class at one of the elementary schools in Stockton, Lincoln, Lodi and Manteca unified school districts. You can then buy an age appropriate book of to read on that special day. When you arrive you will check-in with the office, often there is a hosted reception area so it's a good idea to check in early. You will be escorted to your assigned classroom and then have about 45 minutes to visit with the children, tell them about yourself, and share your book. Often they have lots of questions and the time goes by quickly. Upon leaving, you will leave the book with the teacher to add to the school library. If you can find time in your schedule to help out we would love to have you. There is no cost for registration the only cost is the book you choose. Hey buddy, can you spare an hour? Would you like to join others in the community at this fun activity? Last year we had in excess of 800 readers just like you. We plan to have even more this year and hope you can be one of them. Tell your family, friends, and co-workers. Get a group together from your family, school, church, work or even neighbors. Join the fun! If you're eager to participate in the Rotary Read-In on Thursday, February 21, 2019, please contact Jim Dugoni, 209-607-9661 or jimdugoni@gmail.com for more information.